We are home now and busy trying to figure out just what our new "normal" will be for the next couple of months. Right now, we are bouncing back and forth from one parent to the other and trying to get our "spaces" set up as best as possible. At this point I feel like we are children of divorced parents being thrown back and forth due to custody rules. I'm kidding, it's not that bad. We just haven't figured out our schedule and what's going to work best for everyone. I know I'm a little late on the Halloween details, but we had a blast. We didn't dress up, but we did carve pumpkins and watch the UT game. It was the first time in a long time that I actually had trick-or-treaters to hand out candy to. We saw some really cute ones! Every time we would move I'd always get excited in hopes that we would have some trick-or-treaters and every time, I have been disappointed. I'd always make Michael go outside and ring the doorbell and trick-or-treat me. Sad, huh? We did some home searching over the weekend as well and I discovered I'm pretty particular this go around. It's going to take a lot of searching to find the perfect one and the perfect neighborhood. We will see what happens though. At this point we aren't in any rush. We have to wait for new counter tops to be put in before we even list our old home so it probably won't even be on the market till December. I have some book reviews I need to get caught up on this week. And to my total surprise I actually gave in and bought Twilight. I've resisted it for so long, but I decided I'd give it a chance since I'm going to have some more free time on my hands. I probably won't do a book review of it till I finish the series since it's old news to everyone at this point. Hopefully I'll be surprisingly pleased. I'm not usually into that sort of thing. Keep up the fabulous blogging! 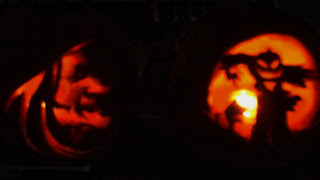 Love the pumpkin carvings! They look amazing. I'm curious on what you will think of "Twilight." I can't bring myself to read the books or see the movie, although at times I feel like I may one day break down and read them... Hope you enjoy them.